KiCAD PCB design is something every electronics maker should learn and use for their printed circuit boards. It does pretty much everything and it’s free. Up til now, I have described my wideband magnetic loop implementation in terms of circuit design and testing using LTSpice. Now, it is time to take the next step and fabricate printed circuit boards. I found this was a great opportunity to learn KiCAD. 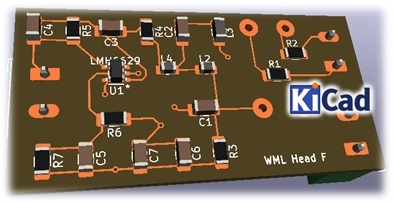 KiCAD PCB design turned out to be relatively painless. Pronounced “Key-Cad”, KiCAD is an integrated suite of program for electronic design automation. My previous tool was ExpressPCB. I found the step up to KiCAD quite easy. You can download the program here. You might want to watch a demonstration of KiCAD PCB design in action, either now or later. The basic steps for design are largely sequential. First, create a project. Second, capture your schematic. This involves placing components on a sheet and wiring them together. This includes the type of component and its value, such as a 50Ω resistor. Third, and this is important, assign a footprint to each component. By doing this, you tell KiCAD the size of the component. KiCAD’s footprint library is extensive. Your fourth step involves transferring the schematic design the KiCAD PCB screen where you place the parts physically and connect the diagram using traces. I discovered a feature never seen before, namely the ability to assign 3D models to the parts and visualize what the actual PCB will look like. Finally, you can transfer your design to Gerber and Drill files which can be used for third party PCB fabrication. Of course, you can also just plot your design and etch the board yourself. The above graphic shows the actual design of my wideband loop head end amplifier as created in KiCAD. Pretty amazing. This is the front of two layers used for placing SMD parts and their signal paths. My bottom layer covers ground plane and power connections, as well as screw terminals for external connections. My final board a just under 1″ by 2″. KiCAD does not contain an auto-router so the traces were placed manually. However, I found the program provides a lot of hints and options. You can make changes to the schematic and they update the PCB automatically. Finally, KiCAD is free and supported by a very large user community and great documentation. It is so widely used that you can find libraries of part footprints and 3D shapes for pretty much anything you design.